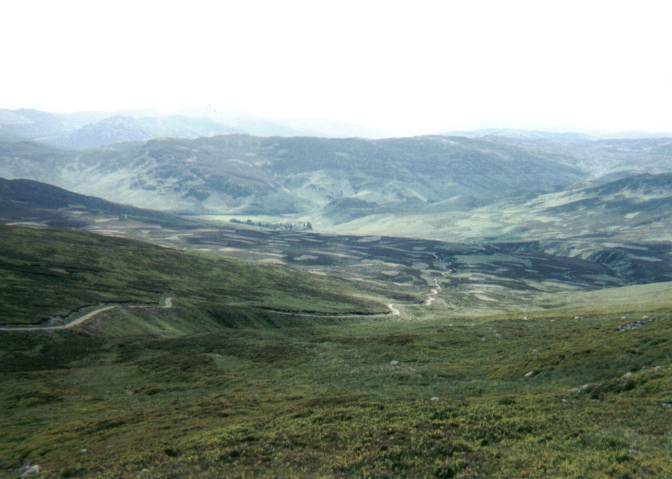 Rising between Strathearn and Loch Tay, Ben Chonzie - sometimes referred to as Ben-y-Hone - is a solitary Munro but one well worth seeking out. The route to the top is fairly straight forward and takes you through some very pleasant open country. From the car park, follow a track north, signed for Ardtalnaig. This skirts between open fields to reach a cluster of cottages at Coishavachan a short distance on. Bear right at a public footpath sign and follow the track along the front of the buildings to a gate. Go through and the way curves left to lead out over open country, passing patches of woodland and a small pond on the left. It rises very gradually, twisting left to cross the Invergeldie Burn and passes through another gate at this point. From here, the track begins to rise in earnest, curving right to follow the stream up hill. 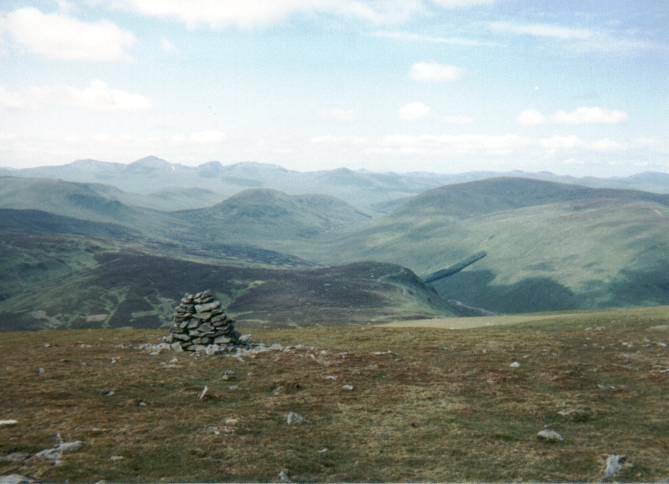 As you ascend, Ben Chonzie (pronounced 'ben ee hoan') looms into view over on the right. Further up there's another gate to go through as you enter a conservation area where efforts are being made to protect ground nesting birds. Ignore a grassy track on the left a short way on and follow the main route as its drops to the right to cross a dry burn, the water drained from it by a concrete dam above. On the other side, the track curves right over the open hillside, before cutting back to climb through the heather. About half a mile on from the dam, you will arrive at a junction of tracks. 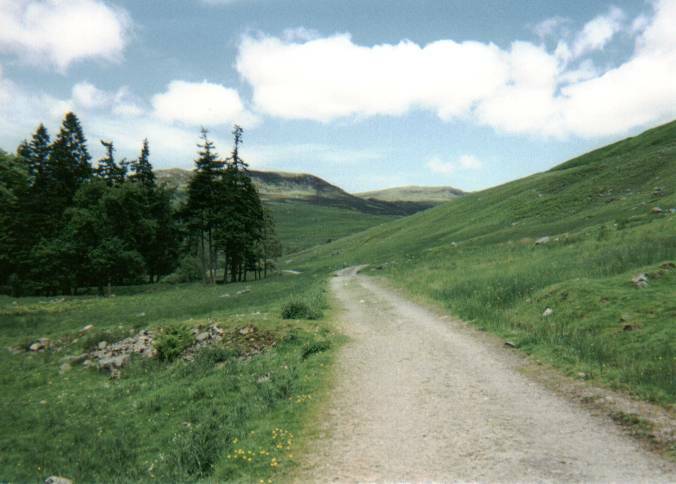 The route on your left crosses a small burn and leads through the glen to eventually reach Ardtalnaig, on the south shore of Loch Tay. Don't take this but carry straight on up, following the track over the hillside until you reach a cairn about a mile further up where a path branches off on the left. The way is a little indistinct in places and can be wet underfoot. As long as you continue to go up you can't go far wrong. It rises on to a broad shoulder, dissected by a line of rusty old fence posts. When you reach these, bear left and follow them north west along the broad ridge. As you go, keep an eye out for mountain hare - Ben Chonzie is famed for having a healthy population of these creatures. The fence line makes a sharp right turn in due course. Continue to follow it over increasingly stony ground and it will lead you to the top. A large stone enclosure where you can shelter from the elements marks the summit. Here you can enjoy views south over Loch Turret to Crieff. To the north, on a clear day, the Ben Lawers range is visible. To return to the start, retrace your steps to Coishavachan. 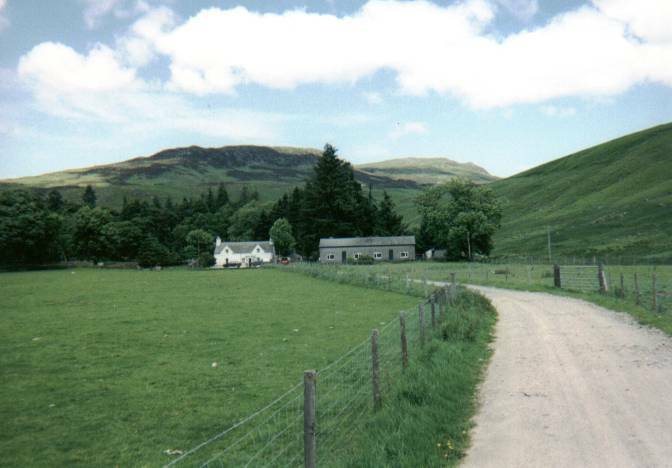 Start Coishavachan in Glen Lednock, four miles north of Comrie. GR: NN 743273. Parking There is a small parking area at the start. This can be reached by following the single track Glen Lednock road from Comrie. Don't obstruct the access track to Coishavachan. Grading A route for reasonably experienced hillwalkers. Dogs should be on the lead due to sheep grazing and ground nesting birds in a conservation area.